Derailed Express is a secret level in Rocking Range in the game Wario Land: Shake It! It can be explored after Wario finds the secret map in Neon City. The Derailed Express is another level that takes place on a train. 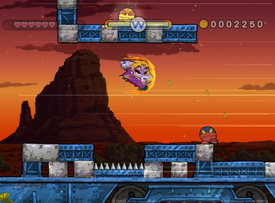 The level takes place in a desert during sunset. Common enemies include Boomdineros and Bandineros. Many fire burners appear in this level along with manhole covers that Wario will have to Ground Pound. Once Wario finds the caged Merfle, he'll have to use the nearby Blast-O-Cannon and Max Fastosity Dasherator to escape the train before time runs out.